A segue before getting to the actual Bookmark Monday stuff: I haven’t posted in a while because my brain seems to want to take a break from writing about books and just concentrate on actually reading them, and also to just keep watching K-dramas instead of blogging about them. XD This has resulted in a bad case of procrastinating on blog posts that I wanted to actually write, and on articles that needed to be submitted like…ages ago. So, apologies to those who have been waiting for the result of the “Hush Hush” giveaway. I will post the results sometime this week. 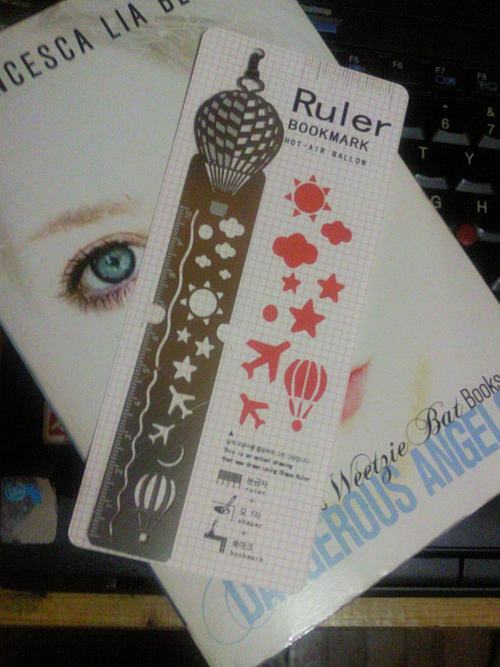 On to the actual Bookmark Monday post! A few weeks ago, Leia and I had a “Museum Day With The Neffy-poos” at The Mind Museum in Taguig. It was tiring (we cannot compete with the boundless energy of young boys) but it was fun! One of my favorite interactive exhibits is Literature-related. Anyway, after roaming around for several hours, we passed by the Museum Store on our way out. We spotted these super cute magnetic bookmarks at the Museum Shop, and of course I could not resist buying them for my bookmark collection. I just wish they had more designs available, and therefore more featured scientists. Bookmark Monday is hosted by Guiltless Reading. This is made of metal and has a clip at one end, which you can use as an anchor on the front or back cover (for paperbacks) or somewhere in the middle of the book. 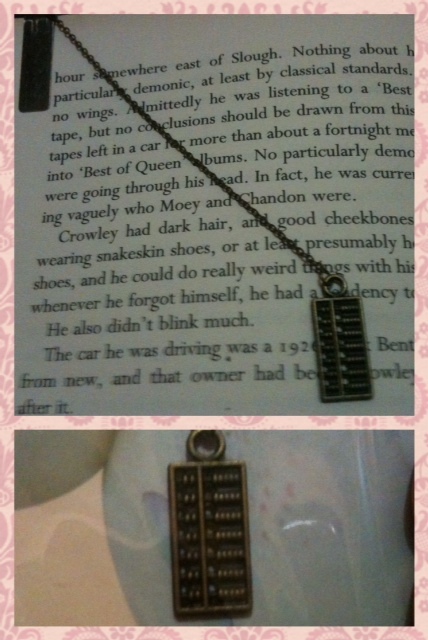 The chain with the abacus charm is then inserted as the place holder. The charm can be a bit bulky, so this is recommended for regular paperbacks whose pages won’t suffer too much with a bulky placeholder. The design of the lady and the cherry blossoms is engraved on a thin, hard plastic. I used my old phone’s camera to take the photo, so unfortunately, it does not properly show how dramatic the gold highlights make the design look. And that movie may have been trashed by critics, but I still loved it. Ken Watanabe is awesome, the costumes and cinematography are wonderful, and of course, John Williams’ musical score is flawless, as always. It’s been a while since my last Bookmark Monday post. But since I cleaned up the house last weekend, I was able to finally make sure my bookmarks are all in one place after I’ve used them. 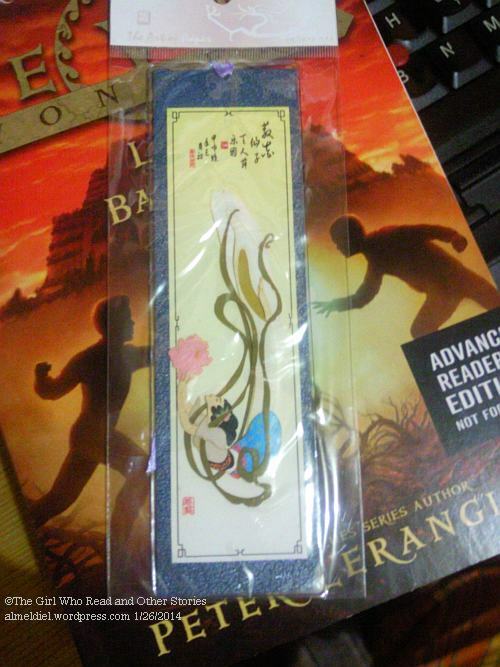 Today’s bookmark is pretty, but it can be impractical. The moon and star are magnetic and are attached to an elastic string. You pull the moon and star apart and use the string to mark your page, then you snap the moon and star back together over the book’s front cover. It’s impractical because the elastic is ideal only for medium-thickness pocketbook-size books. 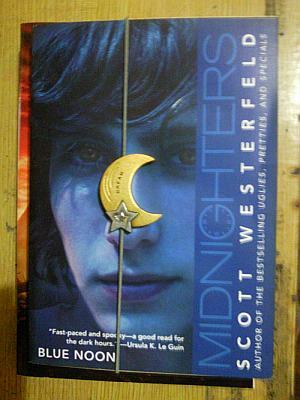 The “Midnighters” book shown here is unconventionally sized–a little larger than a pocketbook but smaller than a trade paperback–but if I go any further reading, the elastic will soon reach its limit. Wow, I’m actually on time for Bookmark Monday! No need for flimsy time-travel excuses today. No, I didn’t come up with a new feature, this is actually for Bookmark Monday. I am posting this on a Thursday because I can bend time and make it Monday! Ever since I got into “The 39 Clues” thanks to friends at Scholastic Philippines, I’ve managed to collect a lot of game cards. 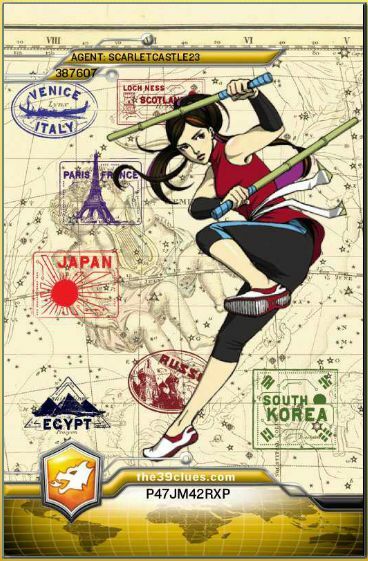 For those who don’t know about the series, it’s multi-media—you read the books, collect cards, use the cards to get clues and play online missions parallel to the story lines of the books, and there’s supposed to be a movie in the works. Since I didn’t know what to do with my cards anymore, I’ve started to use some of them as bookmarks. They’re sturdy, they look cool, and when people see them, they become conversation starters about the series and about books in general. I still keep the cards that come with the books in their respective in-book compartments, but I’ve already discarded the packaging for the cards that I got from separate card packs. 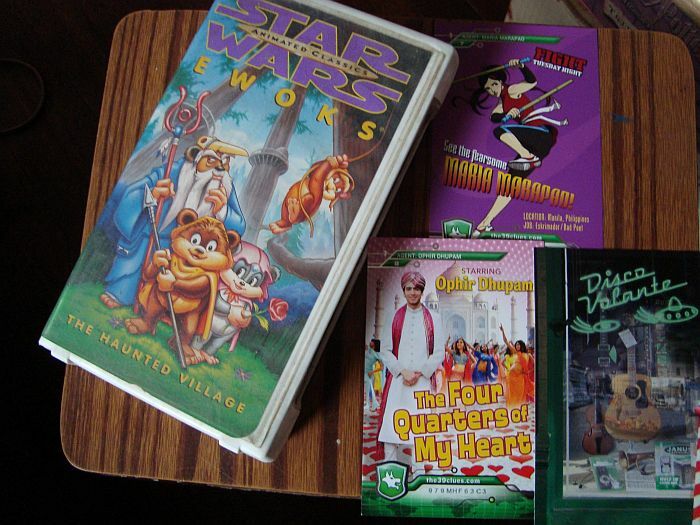 So, I’ve re-purposed an old “Ewoks” VHS case (I have no idea where the actual tape is now. I should send out R2-D2 to find it!) and put all my cards in there. I’m an agent from the Ekaterina branch. Nerds for the win! …but that’s okay! It’s probably Monday in some other universe or something. 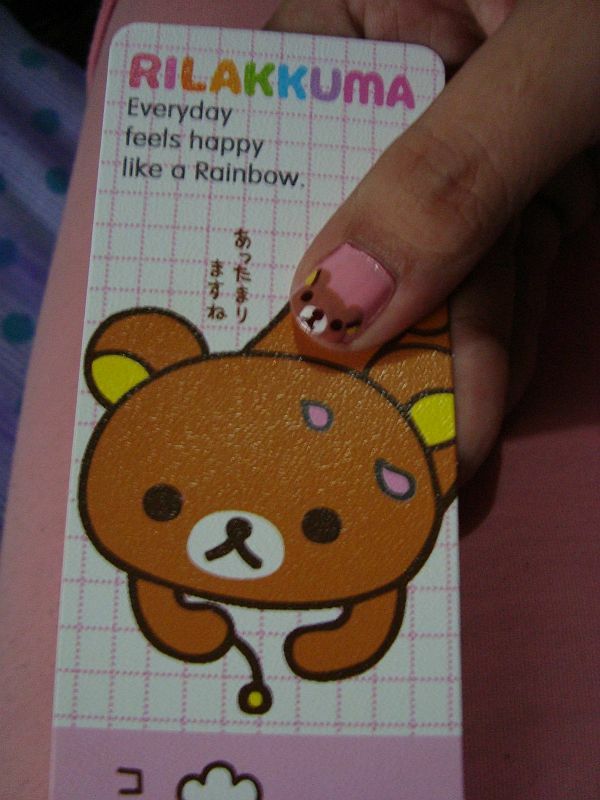 I don’t have anything special today (pretend with me that it’s Monday), just cute and popular bear Rilakkuma. And oh, look, nail art! I’m reading 4 books right now, it’s crazy. Here’s what my dance card looks like: “The Mango Bride”, which is for a review assignment for GMA News Online; “Dying of the Light” for our book club; “Icon of the Indecisive” for Mina V. Esguerra’s secret project; and this book, for which I also have a review request. *chills* This excerpt is so effective at setting the tone of the story, and even more so if you understand the Filipino language. I can’t help but fear for the characters, and nothing’s even happened yet! Confession: I’m a scaredy-cat. I hope I survive this book. “Unseen Moon” is a collection of five suspenseful stories by award-winning Filipino author Eliza Victoria. If you’re interested in purchasing the book, click HERE. Wow, I just realized I didn’t blog for like…a month. So many things to do, so little time! Anyways, time for another Bookmark Monday, this time, featuring some cute little yellow creatures and some cute little girls. 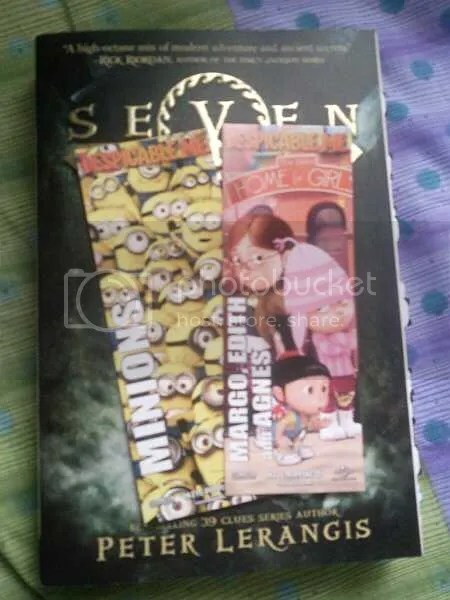 I got these back when there were movie promos for “Despicable Me”. There used to be about 5 different designs, but I gave away 3 of them to other readers already. And the reason why these are shot with “Seven Wonders: The Colossus Rises” is it’s also time for another giveaway, which I will be announcing later this week. Stay tuned! Waiting On Wednesday is a weekly event hosted at Breaking the Spine that spotlights upcoming releases that we’re eagerly anticipating. Even though I haven’t ventured beyond “Beautiful Creatures”—and I do mean beyond the first book—I’ve read enough to be excited by the prospect of Kami Garcia and Margaret Stohl publishing books separately. This one appeals to me more than “Icons”. The premise of a secret group of people whose members are being killed off one by one, making it necessary for their offspring to take their place is nothing new, for sure; I most recently encountered it in Michelle Zink’s “A Temptation of Angels”. But if Garcia can put a different and exciting spin to this, then I’m on board. Everything changed on The Day. The day the windows shattered. The day the power stopped. The day Dol’s family dropped dead. The day Earth lost a war it didn’t know it was fighting. Since then, Dol has lived a simple life in the countryside — safe from the shadow of the Icon and its terrifying power. Hiding from the one truth she can’t avoid. She’s different. She survived. Why? Just please don’t let this turn into another YA X-men. One of the reasons why I am very curious about both these books is I want to see more of Garcia and Stohl’s individual styles. They admitted that while working on the “Beautiful Creatures” series, they couldn’t tell who wrote what anymore once they’re finished, suggesting that their writing styles are similar enough or at least that they can adapt to each other’s style to produce stories that don’t sound schizophrenic. But I really want to get to know both authors better based on their own merits. I hope these are worth the wait.